Geese say: "Honk if you can sponsor us!" 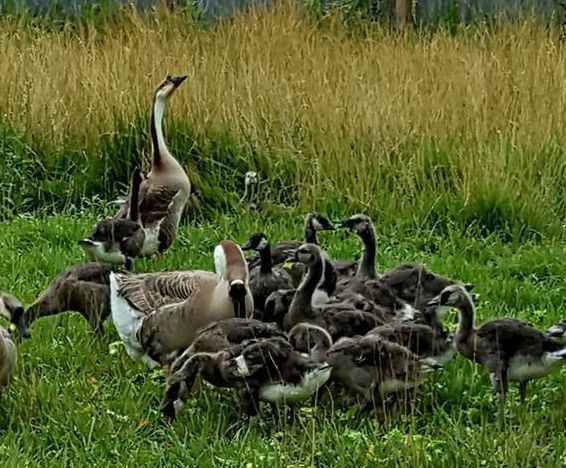 Carolina Waterfowl Rescue accepts many wild and domestic geese with injuries that go through rehab and then live at the rescue. Many are disabled, some unable to fly, others unable to walk well. Many are Easter pets that owners don't want once they are older. Our over 100 geese have a place to roam and swim, safe from predators and able to live their life with many friends. Please consider being a part of their lives in a special way, by sponsoring their care! CWR has a big heart for waterfowl and farm animals in need. Our yards are filled with roaming, happy geese families and their duck and chicken friends. Now we are offering a unique opportunity for individuals to partner together to sponsor their care, which is approximately $1600.00/month for their feed and basic veterinary needs. Carolina Waterfowl Rescue (CWR) is non profit 501 (c)3 wildlife rescue organization located near Charlotte, NC. CWR is run by federally-licensed migratory bird rehabilitators specializing in waterfowl. We take in thousands of wildlife, exotic, and farmed animals a year, and cover close to 40 different wild bird species. CWR is a non-profit group that donates their time, money and expertise to helping North Carolina's animals in need. We also accept domestic or exotic ducks for placement, do nuisance referrals, and offer bird, duck and goose rescue assistance.